This was the third race in the Canadian Triple Crown: the Hurt’n Albert’n 550 (HA550). 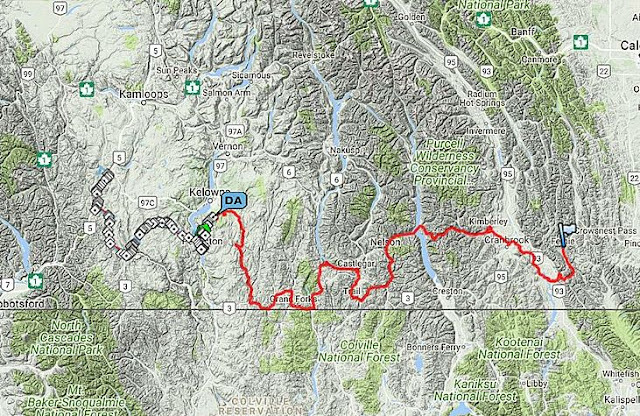 The first two races were the BC Epic 1000 and the Alberta Rockies 700 (AR700). Tom DeVries was the first to complete these three races in 2016 and that was my goal this year. My knees took a bit of a beating after the steep climbs in the AR700 and it took a few weeks to recover…mostly. James at Active Physioworks in St. Albert said that I strained my tendons at the front of my quads and they were still sore from time to time. That was my biggest concern for this race. I wasn’t sure how my knees would feel after a big effort. We’ll see! Justin and Trevor, the organisers, determined the campsite at Beiseker was going to be the start, mid-point, and finish of the race and it worked out great! We arrived the night before the start and were able to catch up with some of the other racers while we set up our tent. They also planned on having a BBQ for the riders after they finished the first loop of about 320km. Squirt the skunk was the start and end point. It was fantastic having a place to park your vehicle for the duration of the race. My family was with me, but there were others that were riding alone. It would be a big relief to finish the race with your vehicle waiting at the end instead of having to shuttle back to the start. We set up our tent and got to sleep. My goal for this race was to be efficient as possible and keep my stopping time to a minimum. The night’s sleep was pretty good in the tent. There was a moment when a train went rambling by. I heard it from a ways away and it just kept getting louder and louder. It sounded like it was going right through the campsite. In the morning, I saw the tracks and they did go right beside the campsite. Other than that little intrusion, sleep was good. I wanted to sleep well because I planned on riding the whole route straight through. I got up and started getting ready. Justin and Trevor made some wonderful breakfast burritos so I had a couple of those. I got my bike ready to go the night before so I just had to get dressed and eat. All the racers lined up at the skunk for some photos. It was good seeing Mike at the start line. 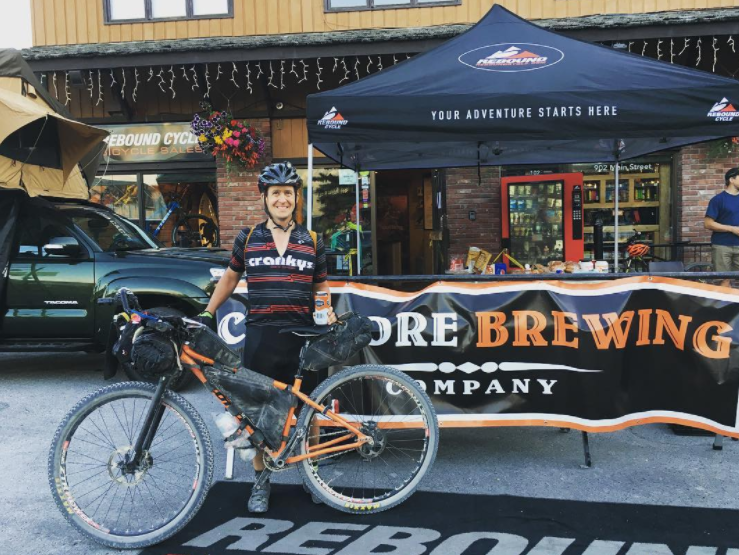 I met Mike at the 24 hours of Adrenalin a few years ago and this was his first bikepacking race. He was a strong rider so I knew he would do well. We rolled out of the campsite on the pavement on a neutral start. It was a chilly, foggy, and very beautiful morning. I had a chance to talk to Adam, who won the AR700 a month or so earlier. We turned the corner onto the gravel and the race was on! Adam took off like a shot! It wasn’t too long that I couldn’t see him anymore. I wanted to ride at a steady pace to stay near the front of the pack, but not too hard to burn out. It was nice, fast riding all the way up to the foothills. I brought enough snacks to sustain me for the whole ride. I was trying to avoid stopping at stores, but when the store at Water Valley appeared in the distance, I succumbed to the temptation of a cold drink and stopped. I also bought some cold water to refill my dromedary in my frame bag. Mike and Ryan were there too. It was a quick stop and we were off again. Ryan left first and Mike and I rode together for a short while until he pulled away on the hills. He is a strong hill climber! The temperature started to increase and I settled into my “forever pace”. Not too hard, but hard enough that I didn’t feel like I was slacking. As I rounded the corner to turn onto the Trunk 40, I saw Justin and he had some ice-cold Cokes! I happily grabbed one and kept on riding. Best Coke ever! Just after I got the Coke, one of my hamstrings started to cramp. That had never happened before! I had to stop and let it relax. I decided to take some old electrolyte pills I got in Salida on the 2016 Tour Divide. I kept riding trying not to activate the cramp in my hamstring. I stopped for water at the Waiparous Campground. There was a sign saying the water had to be treated so I put in some tablets. As I continued, my stomach didn’t feel right. Nausea. Another new thing to happen to add to the cramps. Maybe it was the really old electrolyte pills. I knew it would pass eventually so I kept on riding. Lows always give way to highs on these rides. I made sure I kept eating and drinking even though I didn’t feel like it and pushed through the bad feeling. I started to lose energy, but kept on pedalling, although at a slower pace. On the paved section around Waiparous Village, I saw Megan taking pictures. It was nice to see someone who knew about the race and lifted my spirits. After Waiparous Village, I continued to feel nauseated so at one point, I stopped to take a quick nap to see if that would help. It helped a bit and I felt things were coming around. The organisers left a water cache at a creek and I made sure to take advantage of that. I filled up and continued on, happy that my nausea had for the most part gone away. Low gone, on to the high! The sun started to fall and the sunset was beautiful. Sunrise and sunset are my favorite times during these rides. 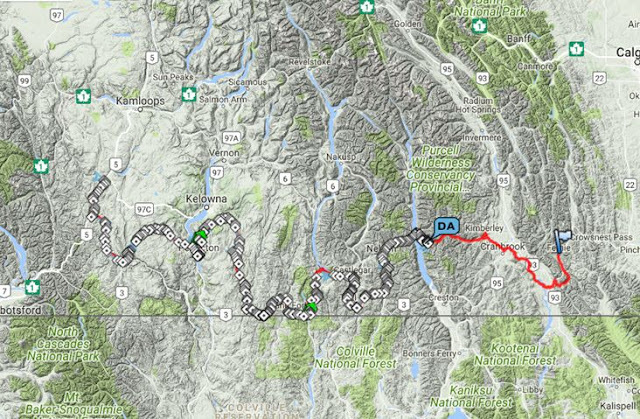 I approached HWY2 and saw on Trackleaders that Adam and Niels had stopped nearby. I crossed the highway, but didn’t see them as I rode on past the construction and back onto the gravel towards Beiseker. As the darkness set in I saw some strange animals for the area. First was a family of racoons! I didn’t think there were racoons in AB. Then I saw a dark lizard on the gravel. Strange, but cool. 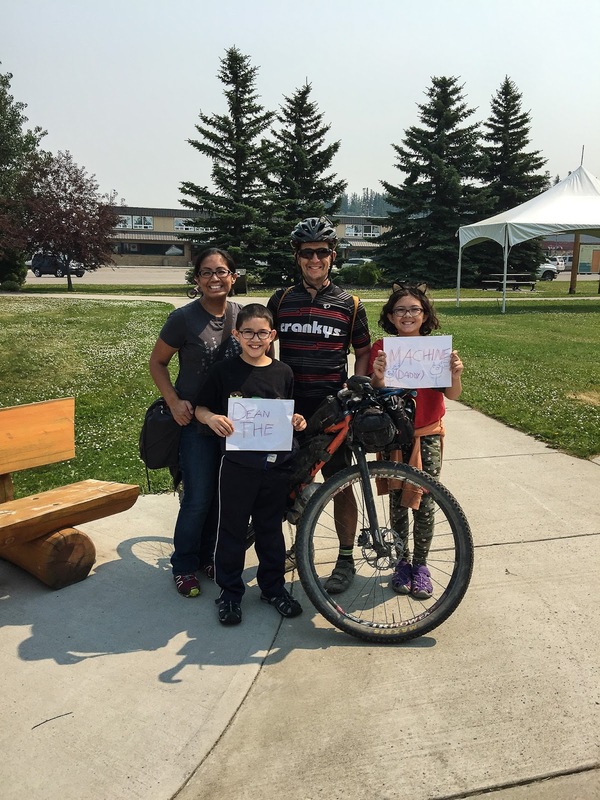 I pedalled on waiting for Beiseker to get closer, thinking about the burgers on the grill. I got to the campsite about 11:30 PM and headed straight to the bathroom to clean up. I felt great, nausea was gone, my face was clean from the sweat, and I was going to have a burger! I stuck around for about half an hour. I stuck my head in my family’s tent and said hello and enjoyed a burger. One regret I have is not having some of Trevor’s microgreens on the burger. He was offering a salad, but I never thought to put the green on the burger until I was back on the road. I found out Adam and Niels had to pull out of the race so I was in second! Ryan had taken off so I was motivated to ride on as quick as I could. I rolled off into the night in good spirits. As I rode on, the wind started to pick up. It was a SE wind so it wasn’t directly a headwind, but it was a challenge at points. I started to get a bit tired as I do after having a big meal so I laid down at the side of the road for a short nap. It didn’t take long before I felt sleepy again so I had to take a couple more naps over the next couple of hours. After those, I felt more awake. 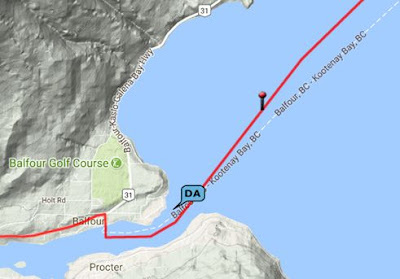 I had cell reception so I was able to check Trackleaders to see where Ryan was. It’s nice to check, but it can also be a distraction that slows you down. That’s what happed to me. Every 20 minutes or so, I would stop and check. I started to force myself to just ride and not concern myself with where Ryan was. When dawn appeared, I checked Trackleaders and found I had passed Ryan in the night while he slept. I was out front! My mind now shifted to how I could stay there. The wind was getting stronger so when travelling East, it was a big headwind and when travelling North, it was a big tailwind. Since I was on a single speed, I knew the geared bike would be an advantage on the flatter sections with no wind or a tailwind. All I could do was keep moving and be as efficient as possible with stops. The sun was rising and the badlands appeared. The scenery was cool with the river valleys cutting big troughs through the flatlands. When I rolled into Wayne, I needed some water. I saw a campsite and asked some of the campers where I could find some. They offered bottles, but I wanted to stay true to the rules and find the commercially available water. The stores were still closed, but I found a spigot to fill up with. I filled up, dumped some garbage, refilled the feedbags and was ready to finish the ride. I hoped it was a quick enough stop to stay ahead of Ryan. As I crossed the North Saskatchewan River, and got up on the flatlands, the wind really started to howl. Sometimes it was a nice tailwind, and others, it was a sidewind where I had to lean my bike to go straight. At one point heading to Drumheller, I lost sight of the gpx track. It didn’t follow where the road was. I tried several roads, and ditches trying to find the intended trail, and eventually got back on track. Off to Drumheller I rode. I was looking forward to buying some cold water since the temperature was increasing. I stopped in a store and checked Trackleaders. I saw Ryan had taken the highway straight into Drumheller and skipped part of the route. I hoped he was okay. I had mixed feelings. I was happy that I probably would keep the first place position but was enjoying the challenge of staying out front. I accepted the circumstances and kept pedalling on. 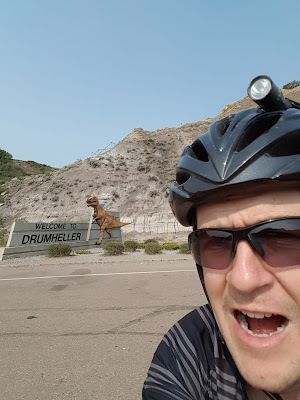 Along one section, my Etrex was zoomed out a bit far and I found I was riding on the highway when I should have been riding on the frontage road. I turned around and rode to the frontage road to make sure I stayed on course. I wasn’t too far and the day was nice so it was no big deal. I reached the end of the river valley and started the climb (or walk) up the steep hill to the flatlands again. The home stretch. As I pedalled along I didn’t have that sense of urgency of Ryan chasing me so my mind wandered. The heat increased and I started to feel tired. I had been riding for about 30 hours so I was eager for the race to be over. I was looking forward to having the SE wind become a tailwind, but around noon, the wind changed direction to a SW wind. Now it was a headwind again. Great. All I could do was pedal and wait for the finish to come. I started to get really hot so when I saw a slimy green lake of water, I decided to dip my jersey in it to cool down. I tried to find the least slimy water, soaked the jersey and put it on. It was a nice relief from the heat. Eventually, I came to the last really long straight stretch of road to the finish. 40km of rolling hills covered in deep, freshly laid gravel. The downhills were nice, but with the loose gravel, my momentum died before reaching the uphill. I had to start pedalling and many times, I was walking the section near the top. Mentally, this was the toughest part of the race. I was tired, the hills never seemed to end, there was a headwind, and I wanted to be done. What else is there to do but keep pedalling…slowly. It felt like the longest 40km of my life. But like every low, it ends. I reached a corner! That meant I was almost done. I upped the pace in excitement of being able to finish the ride. As I approached the finish there was my family and a group of others. So often in these races, the end is anticlimactic with few or no people at the end so this was great! The Triple Crown was done and I actually got a first place finish! Eleven days after the BC Epic 1000 and I was at the starting line of another race. This one was 740km from Coleman, AB to Hinton, AB. Kristin drove me to the line at about 6:30 am. We got some breakfast at the Tim Hortons down the road after a long wait. The Sinister Six, an ultra-running race was scheduled the same weekend and many of the runners were there for breakfast as well. We got to the Rum Runner early enough to set up the bike and talk with some of the other riders. It’s nice to get to know some of the familiar faces at the start. It seems there are others with the same mental problems of enjoying riding your bike for hours and hours so a lot of the same people do these kinds of races. The bronchitis I had during the BC Epic seemed to be better for the most part. I had a small cough, but nothing too serious. The doctor gave me a steroid inhaler that I took a puff from at the start, but I didn’t use it for the rest of the race. It didn’t seem to do anything. We took a group photo and we were off. I changed my gear ratio to 34:22 because I knew the hills were steep, and there were a lot of them, from my ITT run of the course the previous year. It was going to be an experiment on how slow I was going to be. On the flats, I would only be able to spin up to about 18-20km/hr, but I should be able to ride all of the hills. I walked a lot the previous year. The theory was, if I could stay on my bike most of the race, overall I should be faster. Right out of Coleman is a big climb. Up, and up we rode. I stayed somewhere near the front and just tried to keep a steady pace. On one descent, we were speeding down the hill at about 40km/hr. I looked up and saw a big cloud of dust. Rabih had flipped over his handlebars and crashed on the gravel at this high speed! Jonathan and I stopped and helped him pick his stuff up and to see if he was okay. He had some road rash, but didn’t seem to be in too bad of shape. He kept encouraging us to go on and keep racing. It looked like one of the bags on his fork had flipped around and got stuck in his front tire. His back tire got bent so he was out of the race. What a shame so early, but it was good he was close to town. I heard later he got a ride back to Coleman. I was glad he was okay. 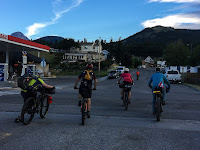 The riders spread out as we climbed on the gravel roads toward Highwood Pass. There was a store at the base of the highest paved pass in Canada so I stopped for a drink and snack. I didn’t want to stop too long and my plan was just to get water, but the temptation of a sandwich and cold drink was too great on the hot day. I saw Tim and Katrina leaving just as I rode up and I wondered who was out in front. I left and started climbing the pass. 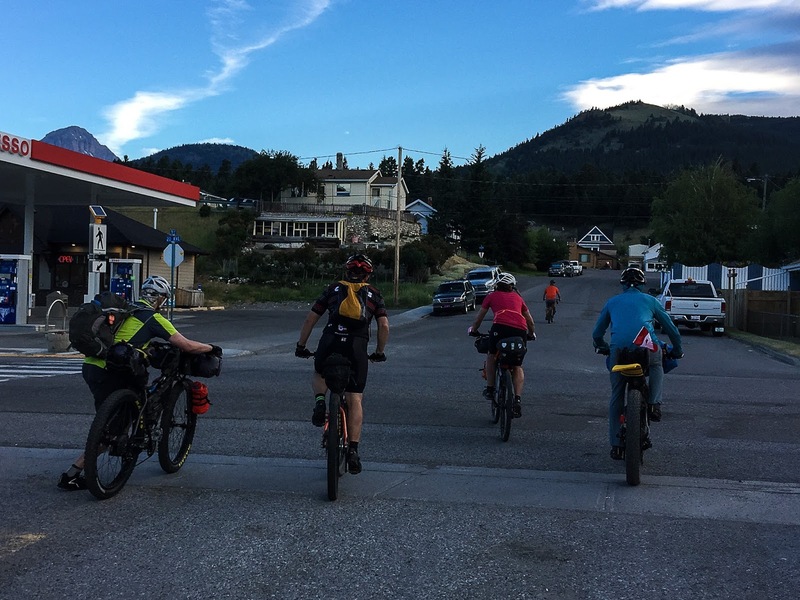 The temperature was climbing, but it didn’t seem as hot as the BC Epic the previous week. The views on the climb were great! At one point near the top some sheep were on the road blocking the oncoming traffic. They did not seem to care at all that they were right in the middle of the road just standing there blocking all of the cars. Silly sheep. Richard caught me on the climb and we leapfrogged each other after we crested the pass. The fast descent was a blast! At the bottom of the paved pass, the trail went back onto the gravel. Hot, dusty, dusty, dusty gravel. There was a fair amount of traffic on the Smith Dorrien Trail all the way into Canmore. I kept looking back to make sure I wasn’t in the cars' way when they drove past. Every once in a while I would see Richard up ahead, but I never quite caught him. The washboards were brutal on this stretch! At one point near the Goat Creek trailhead I saw a little black bear on the side of the road. I blew my whistle, but he didn’t even flinch. He didn’t care about anyone who was around him. I followed a car down the steep hill into Canmore and got absolutely covered in dust. It was in my mouth, nose, ears, and eyes. I was very happy to see the pit stop at Rebound Cycle. I had a burger, drink and got cleaned up at the pit stop. I wanted to make my stop quick, but again, the temptation to take it easy and talk to the people there was too great so I hung around for a bit. I rode out with Katrina and we stopped at a store on the way out of town to get some food. 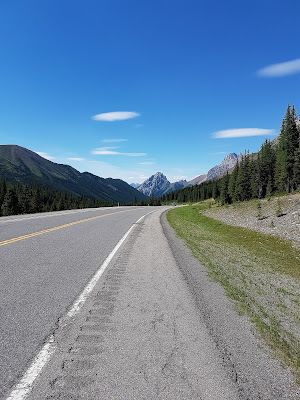 The ride out of Canmore to the Ghost Lake campground was all paved and pretty flat. Katrina stayed with me and I felt like I was slowing her down. With the easy gear ratio that I chose for the hills, flat pavement was pretty slow going. We ran into Richard again and he passed us and rode off into the dark. We got to the Ghost Lake campground around midnight and we were both ready to stop for the night. We cruised around the campsite and it was full of loud and drunk RV campers. I didn’t want to stay there since I thought it would be quieter on the side of the road somewhere so I moved on. Later I found out that Katrina moved on as well since it was too loud and rowdy. I stopped on the side of the road a few kilometers up and made camp. It was a hot, humid night and I managed to get a good night’s sleep. I was in bed by 1am and set my alarm for 4am hoping to get a jump on the other riders. I woke up to a beautiful, clear, foggy morning. The sunrise was awesome. The road was pretty flat and paved for the first while and then turned into gravel. I stopped for water at a creek and Kyle rolled up. He mentioned that he heard me ride by in the morning and rushed to catch up. Ugh! I have to remember to camp ahead of other racers in the future! We rode the gravel together for a short while and then he started to slowly pull away. Richard approached from behind as well and started to ride away with Kyle. Their paces were similar and they ended up finishing the race together. I kept plugging along at my pace wondering if anyone else was going to catch us. I knew this stretch was a lot of steep climbs so I was happy with my gear ratio. It was, however, too easy to stand and pedal. Whenever I stood, it felt too easy and my speed dropped. Most of the climbs consisted of sitting and grinding out slow rpm. The day went on and it got hotter. Trucks and RVs would pass every so often. It was nice when they would give a little honk to let me know they were approaching. I would have a chance to get to the side and let them pass. Cooperation goes a long way to keeping everyone happy on the road. At one point in the afternoon on a climb I started to doze off. I stopped to take a quick nap and thought I would check to see if I had service so I could check Trackleaders. I did have service and saw that Katrina was only a few kms behind! That woke me up out of my stupor so no nap needed! I got on the bike and started climbing again. I saw Kyle and Richard were a few kms ahead and I wondered if I would catch them. There was a bit of a break in the climbing and I came into a flatter section. I was riding into a bit of a headwind and all of the sudden there was Kyle and Richard. They were on the side of the road getting water. I happily gave them a wave as I rode by. When would they catch up to me, I wondered. After a short while nature started to call. I was approaching the campsite that I stayed at in 2016 and decided to stop. Actually, it was more of a necessity than a decision. I got of the bike and frantically rushed to make a deposit. I figured Kyle and Richard would pass me, and after I got back on the road, I saw they did when I spotted their tire tracks. The climbing started up again and for some strange reason I was really enjoying myself. It must have been the scenery and cooler temperatures later in the day. I started counting summits to climbs. 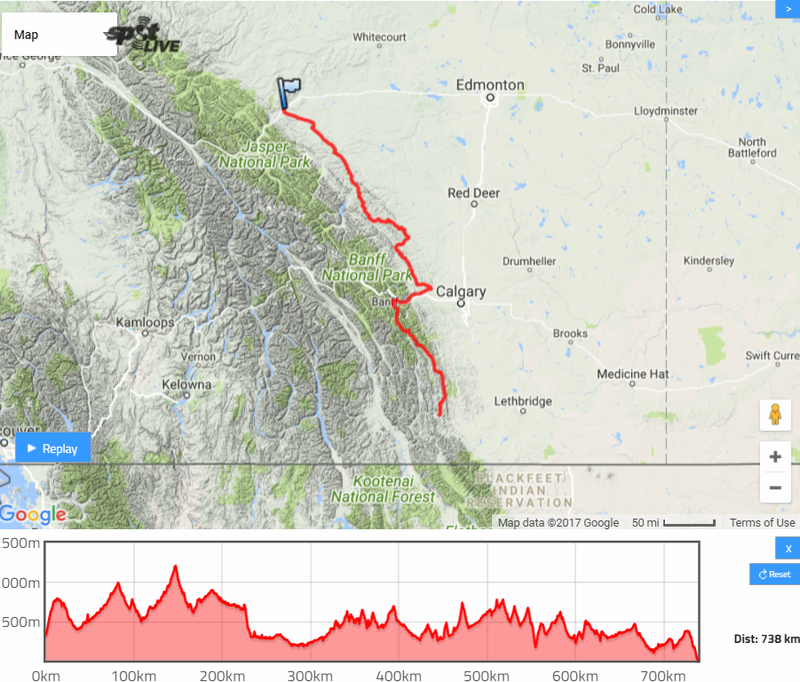 I remembered the steepest climbs were south of the North Saskatchewan River so getting past the river was my small goal for the next while. After riding for a while, I stopped seeing Kyle and Richard’s tire tracks. I wondered if I passed them. It became a game in the dimming light to try to see tire tracks in the road. Sometimes I thought I did, and others I didn’t. The doubt was dispelled when they rode up behind me. They stopped for a few minutes at one point and I rode past. Just as I got a bit ahead, I heard an expletive and crash. Richard had gotten his foot stuck in his shoe and fell over. I looked back and checked if he was okay. He seemed fine so I kept riding. I found out later that he was wearing road cycling shoes. I just got a road bike this summer and the only crashes and scrapes I got were from falling over trying to get out of those tight cleats. 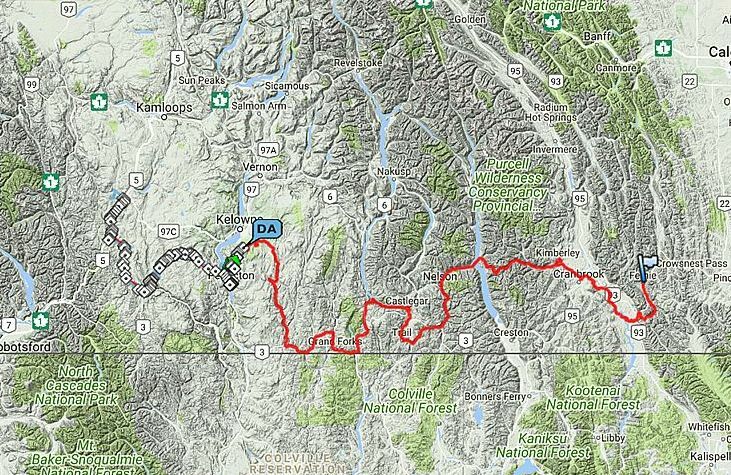 We started the descent to the North Saskatchewan River when it was getting dark. The road was sandy gravel on switchbacks so it was kind of slow going for a steep descent. I pulled away from Kyle and Richard and crossed the river. I was hoping they were going to camp at the campsite there, but as I climbed out of the river valley, they pulled up beside me. We stayed within a close distance of each other until we reached Nordegg at about 12:30am. I was happy they were looking for a place to bivy and was wondering if they needed to resupply in the morning. I brought enough snacks for the whole ride when I started to avoid stopping for resupply so I was good until the finish. As I rode down the gravel toward Robb, their lights eventually stopped following me. I was on my own for the evening. I didn’t feel too tired for the first while, but after an hour of riding or so, I started to nod off. My rule is to never ride while nodding off so I stopped for a quick nap on side of the road. After a five minute nap, I was on my way. This process continued for the next 3-4 hours where I would need a nap every hour or so. Staring at a light on gravel lulls me to sleep I guess. My big light started to blink whenever things got bumpy too. It might be getting worn out after 1000’s of kms of bumpy roads. Eventually the sun came up and the road started to get smoother. With the smoother road came lots of logging trucks. I had to keep looking back to get out of the way when they came rolling along. Then the hallucinations started big time. I had a few riding in the dark when I imagined someone riding beside me, but they weren’t too vivid. This time they were very vivid. I felt alert. I wasn’t nodding off at all, but I started seeing things in the trees. Different wooden shacks would appear and I even saw an RV with a guy under his canopy doing something. Full colour images! I would stare at them and I knew they weren’t real, but they sure looked like it. Oh well, just keep riding I would tell myself. I stopped to take a quick nap with about 100km to go. After my nap, I got cell reception and was able to check Trackleaders. Kyle and Richard were about 40km behind and on their way. I decided I had better keep moving as much as possible. 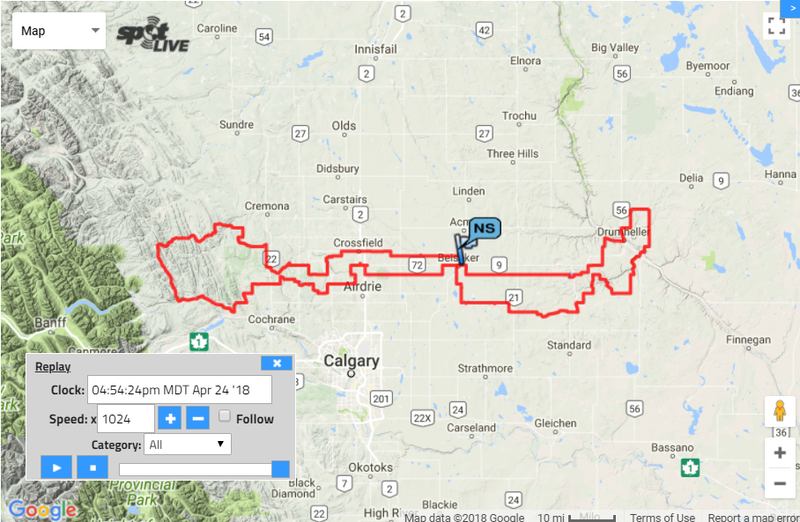 I decided to try keeping my riding intensity up and count down the kms. Keeping my mind busy and heart rate up seemed to work! I rode the smooth downhill pavement into Robb with no nodding off. Good thing because I was on a busy highway. I didn’t stop at Robb and turned onto the last stretch of gravel to the finish. The sleep monster hit one more time and I napped for about 10 min in some tall grass. After that, I was able to continue to the finish. I kept pushing hard and counting kms. My knees had started to hurt over the last 24 hours and I was taking ibuprophen every 4-6 hours to keep the pain down. It’s pretty normal for different things to hurt in this kind of racing so I wasn’t too worried. Eventually the drugs stopped working and by this point now, my knees were protesting heavily. Keep moving, almost done. The road was mostly rolling hills that weren’t too steep so the riding was pretty good. There was one spot near the end where they were wetting and grading the road which made it soupy and hard to ride through, but it didn’t last long. I counted my kms until about 15kms to go and then it was all downhill. I screamed down the road into Hinton happy I was about to be done. I followed the pink line to the end and then it disappeared. The strange thing was I was in the middle of the road…somewhere. 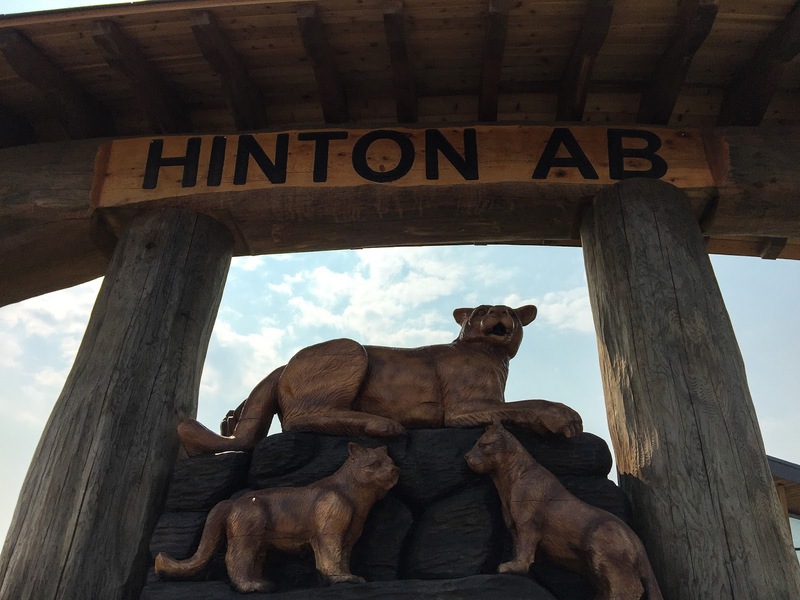 I knew the end was at the Hinton Visitor Centre, but didn’t know where it was. I rode in circles for a while checking Google maps with my phone, but I was too disoriented to figure out where to go for a while. Eventually I found it and was greeted by my wonderful family. They drove in that morning to pick me up. Adam, the first place rider, was waiting as well! It was great to meet him and awesome that he stuck around (for 6 hours!) to see me finish. Done! I was up at 3am hoping to get the jump on Lennard. I knew Gray Creek pass was steep and I would be walking a lot of it so I want to start early. As I was walking, I noticed a pain on my rear end. I thought I would try sleeping in my bibs to save time in the morning; big mistake! I will spare the gory details, but needless to say, my backside was quite sore for the rest of the ride. Once I got to the face of the hill, I started walking. It took forever and I was happy to get to the top. The descent was fast and fun. The trail followed some gravel roads, and then pavement until just before Kimberly. I felt good until that point, but once I got into the steep single track, I started to feel really bad. It started to get hot and I felt really run down. My airway was closing up and I was having trouble breathing. I was having trouble finding the track at times and had to backtrack to make sure I was on course. This was definitely a low point. I knew I would have to stop in Kimberly to get my airway back. I stopped at store in Kimberly for about 45 min to force some food down and try to cough out some gunk in my lungs. I did not feel very good at all. After choking down some liquids and a sandwich I was off again. I felt really sleepy so took another cat nap on the side of the trail. I know with this type of racing that if you feel really low, eventually you will feel good. I was waiting eagerly to feel good again and I started to feel better after Cranbrook. The trail continued on rail grade and went into some fun wide single track after Wardner. I got into a good place keeping my pace comfortable enough where my airway felt good. I rode as it got dark and crossed the big bridge near Baynes Lake. I climbed the paved hill and got to the RV campground as night really started to fall. I found one of the hoses for the RVs had potable water so I filled up for the final push to the end. The trail started to get a bit sketchy at this point. I was having trouble finding out where I was and where the route went. I kept fumbling around in the dark, up and down the gravel roads and narrow grassy paths. The trail spat me out onto the highway leading up to Elko. I remembered this stretch from touring it with Kristin a few years back. That time it was 35 degrees and hot; this time it was late at night and muggy. After Elko, and crossing the river, the trail deteriorated into a steep, rocky, hike-a-bike. I had another airway-blocking coughing fit and had to stop to get my breathing sorted out. The trail gradually got smoother and smoother the closer I got to Fernie. At one point, I started to nod off and took a quick nap. After that nap, I was determined to get to the finish. I felt bad, and couldn’t eat or breathe well, but pushed on. It was cold, but I didn’t even stop to put on warmer clothes. I didn’t want to stop and just wanted to get to the finish line. The sun rose and I pedalled as more and more civilisation appeared. Farm houses and power lines meant I was getting closer and closer. The gravel turned into pavement as I wheezed my way to the finish. I was greeted by my loving family and Chip Andrus. It was great to be done! Kristin had a coffee for me to drink and after I was done that, I could speak a bit better. Lennard pulled up shortly after and we talked about the race. It was so much fun trying to catch him! I went back to the hotel for a shower and quick nap and had breakfast with Lennard, Chip and their families. It was great and I hope to do the race again sometime! My recovery took a little while. I went to the doctor after the race and found out I had bronchitis. He gave me a bunch of antibiotics and I slept most of the time for a few days after the race. It took a few days to recover and I was well enough to participate in the Alberta Rockies 700 race 11 days later. My alarm started beeping and I thought, “Great, I got up at 3am as planned”. I commenced getting ready, had a nice cleansing coughing fit and packed up. Once I started riding, I realised that I slept through my 3am alarm and got up at my 4am alarm. Oh well, I probably needed the sleep. Today was the day with the ferry. About 225km of riding and the last ferry leaves at 9:40pm… no problem. The trail was more pleasant rail grade up and over a pass. The tunnels here were awesome! Some were really long and dark with water dripping from the ceiling. I loved it! On the descent, the trail started to parallel a really big lake. The views were great! I was keeping a good pace and was breathing well. I found the mornings were the best times for breathing well. Later in the afternoon is when my airway would start to close up. I was planning on stopping in Castlegar for some cough medicine. The trail met up with the highway and I followed it down across a big bridge. I stopped to see where a store might be and discovered I missed Castlegar. It was back up the huge hill and off route. No problem, Trail is only about 40-50km away. Hopefully the trail is as easy going as it was in the morning. I continued on. I checked Trackleaders and saw Lennard was about 20-30km ahead. The best thing for me to do is keep on riding and minimise stopping time. Hopefully he would stop to take a nap or something. Haha. Little I knew the trail to Trail (had to say it) was not easy going. The single track was fun, but tough. Steeper climbs than the rail grade so I was required to push my bike at times. The trail paralleled the river and went up and down the riverbank. It even went through the river at times and I had to wade through shin-deep water. I enjoyed it, but it was slow. I started doing the math. It’s 1pm and I have to make the ferry in about 8.5 hours. I am no longer averaging 20km/hr and I have no idea what the trail is like on the way. I had better keep going and hope for the best. On I went, pushing and riding where I could. The trail would go over loose rock and through thick river bushes. Again, lots of fun, but the ferry started nagging in my mind. I resolved to stop fast in Trail and ride without stopping until I got to the ferry. I had no idea if I had to be early to get on either. We recently took the ferry from North Vancouver to Nanaimo and had to be there early to get on. All I could do is ride. Whatever happens - happens. I got into Trail at about 2pm. I had 7.5 hours to go about 120km. If the riding is easy, I should be able to cover that in about 6 hours. If it’s not easy, I would take much longer. I had better hurry!! I stopped at Safeway and wandered the aisles looking for supplies. Gas stations are much easier to resupply in. More cold drinks, less ground to cover looking for snacks, and more ready-to-eat sandwiches. The good thing is they had a pharmacy so I was able to get some cough syrup. I took some, but it didn’t seem to help that much. Off I go to catch a ferry! The road to Salmo was all paved so I made good time. Hooray! Since I had no idea what was ahead, I was hoping I could keep a good pace. On the way to Salmo, the sleep monster hit me and I stopped for a quick nap. I vowed to never ride drowsy due to safety and the fun factor. On the Tour Divide, I would try to push through the drowsiness and it was miserable; not to mention unsafe. I stopped for a quick 10 minute nap and snapped out of the drowsy zone. 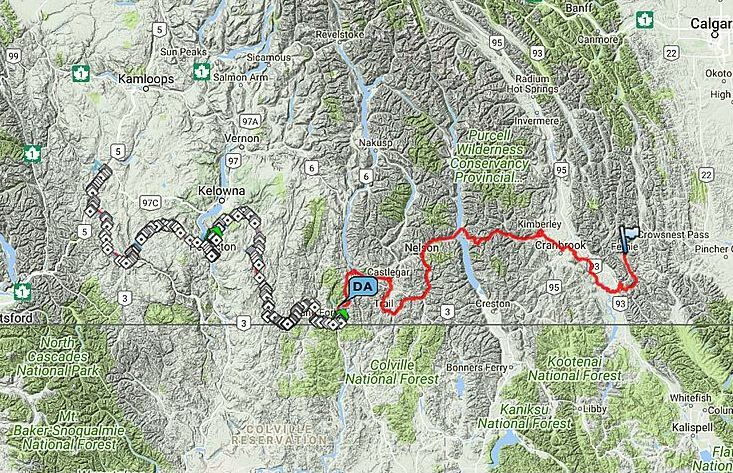 The little magenta line on my GPS turned north at Salmo and I was back on gravel rail trail. Uh oh, slower going. It was about 5pm now. 4.5 hours until the ferry and about 70-80km to go. I pushed on up the gravel rail grade. 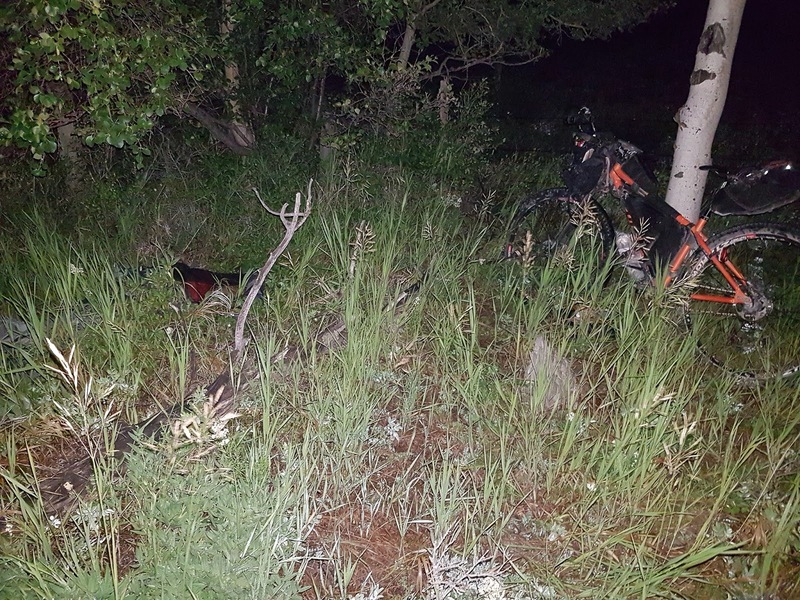 As I reached the summit, I was riding along a creek and heard some crashing in the bushes. I looked to my right and saw the square head of a grizzly on the other side of the creek. I whispered, “Hey bear” (no voice) and kept riding. I blew my whistle a few times, but I wasn’t too worried since he was on the other side of the creek. 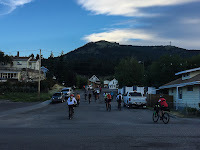 After the summit, I started the descent into Nelson. It was about 7:30pm and I had about 40km to go. This was going to be close. I blasted through town and was happy to see it was pavement all the way to the ferry. I tucked into the aero bars and went as fast as my single speed could take me. My throat was getting drier and drier no matter how much water I drank. I kept rolling and staring at my clock. The darkness fell and I rolled up to the ferry terminal at 9:32pm. Eight whole minutes to spare. I still didn’t know if I was going to get on so I attempted to ask a guy in uniform coming from the boat. I opened my mouth to ask him what to do and nothing came out. I had never lost my voice that bad. I whispered my questions to him and found out the ferry was free and all I had to do was ride my bike on at 9:40. I made it!! I even had time to get some drinks and food at the store at the station. The ferry ride was about 35min long and I had a chance to use the bathroom and charge my battery pack. On the other side, I started riding and looking for a place to sleep. I found a spot in the trees by a creek and go to sleep about 12am. I woke up to a strange groaning sound in the woods. To me it sounded like a bear, but I wasn’t sure if that was my imagination. I heard it a few times, sometimes close and sometimes far, as I was getting up so I thought it would be a good time to pack up and go. I was rolling at about 5am. I rode up the hill wondering if I would come upon Lennard in his bivy; no such luck. I found out after the race he rode until about 2 or 3am and was way ahead of me. 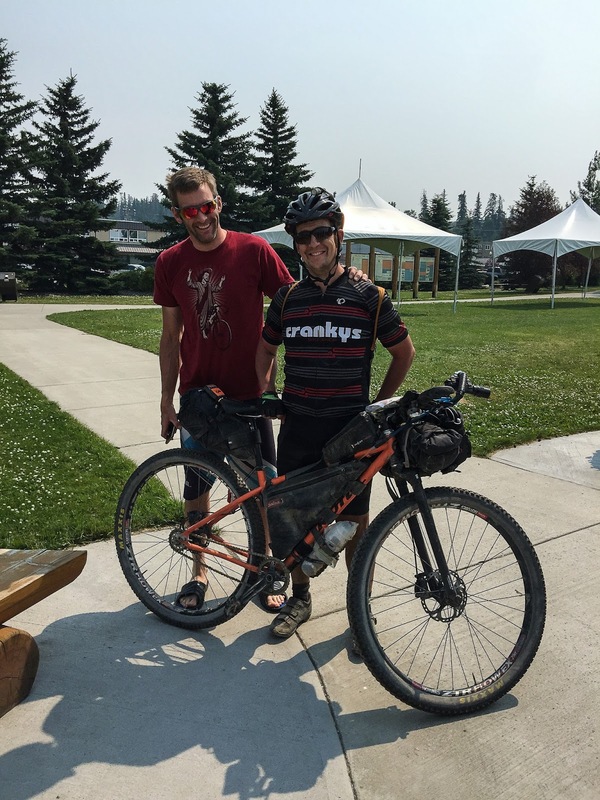 I stopped in Chute Lake campground for some water and talked to one of the campers about the race. Chute Lake was at the top of the climb and from that point on the grade was pretty gentle all the way to Myra Canyon. The trestle bridges here are amazing. The sun was rising, the weather was good, and my cough wasn’t too bad so I felt really good. The trail descended gradually toward Beaverdell and the temperature started to rise. I started hearing a strange rattling whenever I went over bumps so I stopped to take a look. To my horror, my front wheel was loose on the forks! The only thing keeping it on was the ridge on the fork around the quick release knobs. I was very grateful that it didn’t fly off going at high speed. I was also glad that the repair was quick and easy. I tightened my wheel and rode off down the hill. Beaverdell was a welcome sight. I was hot and thirsty. My voice was all but gone, but I could breathe well and I felt good. I stopped and had a drink and too much ice cream. I’m not sure why, but after that little break, my throat started to close up. I had about 70% of my airway at this point, but was still able to continue with little trouble. I just made sure I was drinking and eating regularly. As long as I drank, I could swallow the food. Candy and sweets were going down the best. I think it was Rock Creek where there was a little store. I bought some Gatorade and found out from the attendant that Lennard had stopped for about half an hour. It was good news that I was gaining a little bit. I croaked out a goodbye and got back on the road in the 35 degree weather. The next stretch to Midway was hot and out in the open through farmers’ fields. There were a lot of gates that you would have to open and close on the way through. This is where the heat started to get to me a bit. I was feeling run down, I couldn’t breathe well and it was really hot. At one stream, I soaked my shirt to cool off. I stopped in Midway at the nice air-conditioned gas station for a break. My airway loosened up a bit and I could breathe better after some liquids and ice cream. I remembered not to have too much ice cream. After the nice recovery, I was on the bike in the heat again. It was starting to get a bit later in the day and cooling off. My airway was still not fully open, but not too bad so I was enjoying the gradual climb up the rail grade. I came upon the locked gate Lennard talked about at the start. I remembered it was at the llama farm. I didn’t want to climb over so I managed to slide my bike under the gate. On I rode until I came to Grand Forks about nightfall. I stopped at a small gas station to resupply. I tried to cough out some of the stuff in my lungs and had a scary experience. I hacked some stuff out, but in the process, more got lodged in my airway and blocked it. I had to stop the bike and really concentrate on my breathing because there was only about 10-20% of my airway open. I started the process of relaxing my breathing and catching my breath, then coughing to clear my airway. After a few tries, I managed to clear it out to about 60%. Good enough to ride! I vowed to keep the coughing to a minimum at that point. I started climbing as darkness fell. I stopped on the side of the trail at about 11:30pm to set up camp. Once I got some sleep, I would probably feel a bit better. Dion rolled up and startled me a bit. I wasn’t expecting to see another bikepacker. Lennard and I were pulling away from the field a bit at that point and I wasn’t considering a westbound rider. We talked a bit and he carried on down the trail. I ate my supper and after a nice relieving coughing fit, I went to sleep. Sleeping was a bit interrupted as my breathing wasn’t easy and I would wake up coughing, but I did get a few hours of good sleep. 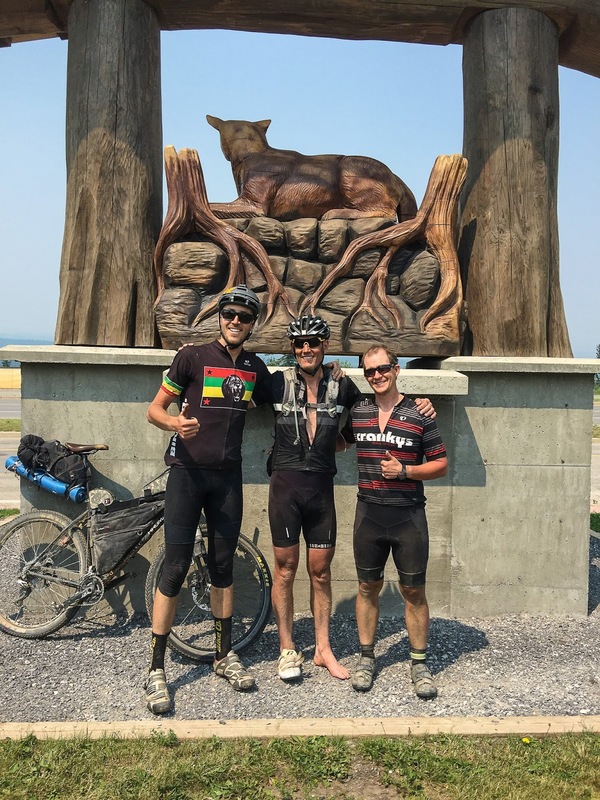 What a great experience racing the BC Epic 1000! 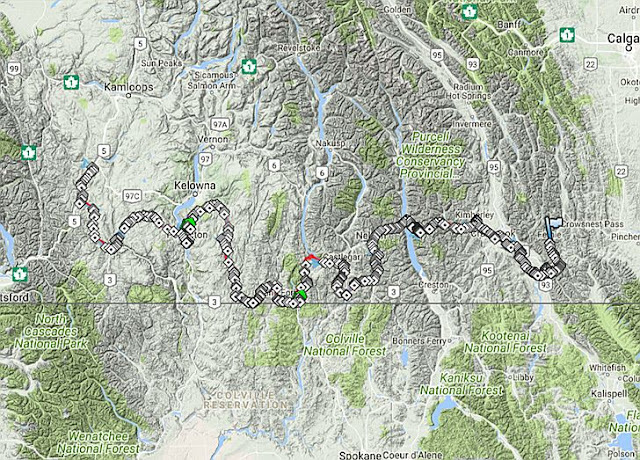 Thanks to Lennard Pretorius for putting together such an amazing route through central BC. This race brought some new challenges I had never faced before. The Monday before the race start on Saturday, June 24th, 2017, I started to feel a sick feeling in the back of my throat. Not a nervous feeling, but an actual cold or something. I tried to ignore it and take some extra vitamins, but I was getting sicker and sicker as the week went on. Being my stubborn self, this had no influence whether I was going to start the race. I was going to ride no matter what. I planned as usual and got my gear ready for the race. 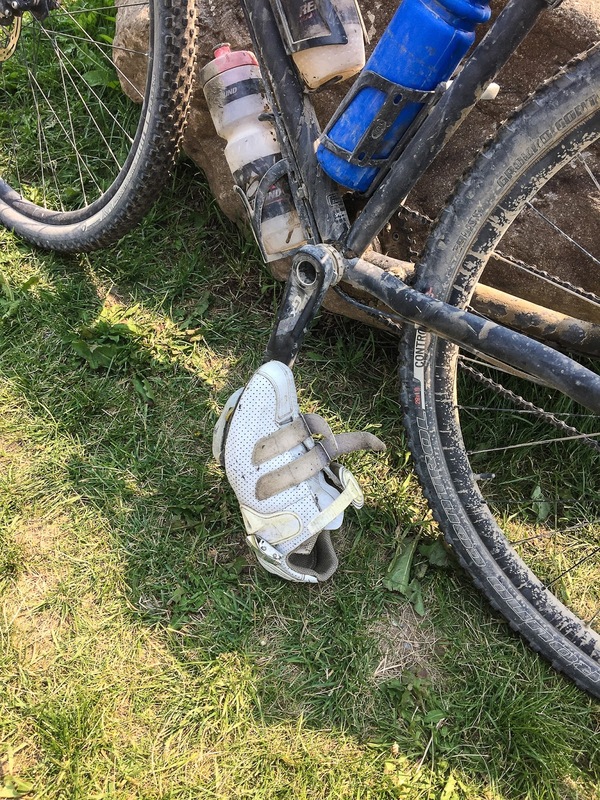 I rode my single speed Kona Unit and picked a bit harder gear ratio of 34:18 due to the trail being mostly on rail grades. This worked out really well. I was able to keep a decent cadence on most of the climbs and still have a decent spinning speed on the flatter sections. I made sure I had my Mike Hall bracelet strapped on my seat bag as a tribute to his legacy. 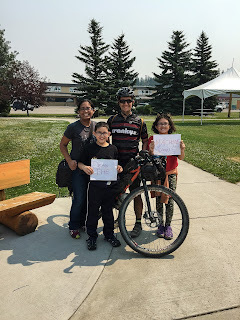 The whole family drove down to Merritt for the start. 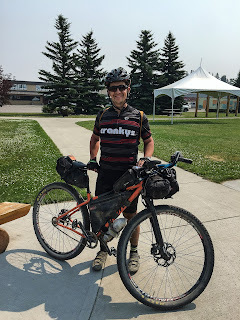 We got to Rotary Park about an hour before the start and I began putting my bags on my bike. With the group photo, small chat with the reporter from the local paper, I was scrambling a bit to be ready on time. I had just enough time to chug back my coffee from McDonalds and packed my BLT bagel for later. In my haste, I forgot my cheap little lock on the bumper of the Pilot. We rolled out of town and before I knew it we were racing. The start was on pavement and I was able to keep a decent pace near the front of the pack. The sore throat I had didn’t seem to be much of a factor at this point. I started getting into the habit of following the rider in front of me and then I saw him turn around. We both went off route a little bit. Not too far, but our turn around resulted in us being in the last group of riders. Then the gravel started. I rode with Dace for a while on the gravel and I was glad I did. There was one section where we had to push our bikes up the side of a ditch to continue on course. He was familiar with this so he was helping me with where to go. We settled into a nice pace and that’s when the ride really felt like the race started. Nice, steady gravel for miles. The day started getting hotter and I started thinking about when I needed to stop. Coalmont came into view, but the General Store looked like it was closed. I was about to ride on, but noticed I was out of water. I circled back and found a post office where I could fill up. Dace rolled up and I said we could get water here. While he was in the process of purchasing a pop, I packed up and kept rolling. My throat felt dry and I was losing my voice a bit, but I didn’t feel too bad. Maybe being sick wouldn’t be too much of a factor…I hope. Before I knew it I was in Princeton. I just filled up with water so I was debating stopping. Then I saw a few bikes at the Subway. This was my chance to pass a few riders so I kept rolling through town. There was a steady climb out of town so I started grinding up the hill. Lennard rolled up, we chatted a bit, and then he started pulling away. The temperature started to get hotter and I started to run out of water. My desire to not stop resulted in the bad decision of passing by some surface water sources without filling up. I thought the Osprey Lake campground would have some water…nope. Before I knew it I was out of water and getting thirsty. I ran into Lennard and Ken and they just got some trail magic in the form of water so Lennard shared one bottle with me. I was incredibly thankful, but could not remember if I actually said thanks. That bugged me for a few days so I made sure I thanked him at the end of the race. I kept grinding away slowly up the hill looking for a water source. Most of the time when I heard water, it was at the bottom of a steep slope. Then I found a nice rushing stream at the side of the trail. I finished my BLT bagel from the morning, washed up a bit and filled up with water. Now I had to wait 30min for the water purification tablets to work. Thirsty!! That water was great after the wait! The descent into Penticton was nice and smooth. I tried to keep eating and drinking lots as the town came into view. As I passed through Summerland, I even got a few cheers from a car. Nice morale boost! I came into Penticton and started riding through town. The route passed through some sort of festival so there were people and cars everywhere. It was a huge party zone. The road was pretty busy so I thought there should be a gas station up ahead. I climbed a steep hill and it looked like I was on my way out of town. I asked a guy on the street if there was a gas station up ahead – nope. Lennard pulled up and let me know that the best resupply was right at the start of town. Route knowledge certainly helps! I resigned myself to backtracking to the store and letting Lennard ride on. I croaked a goodbye (started losing my voice) and headed back into town. 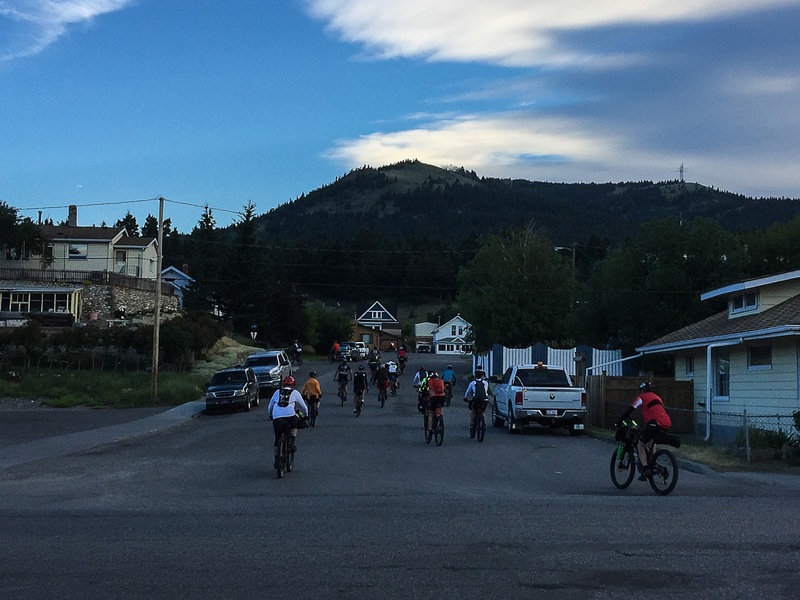 After resupply, spotting an Elvis getting some snacks, and riding through town again, I started climbing the hill out of Penticton at sunset. This was a start of a strange climb. It seemed secluded, then a car would drive by, and then another. Then I was riding through a crowd of happy drunks carrying coolers. Then there were other very happy (drunk or something else) cyclists riding toward me down the hill. I ran into Ken and we rode together for a short while until he decided to camp close to a picnic table and outhouse. 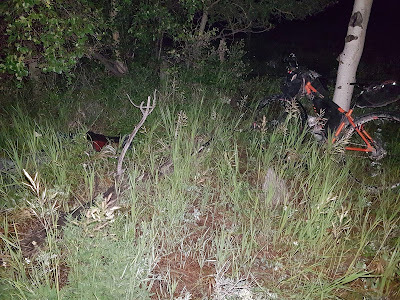 I kept riding for a while and stopped about 11:30pm and set up camp behind a rock outcropping just off the trail. Just as I got comfy in my bivy, another group of very happy cyclists came coasting down the hill. I laid quietly as they loudly organised themselves and chose their playlist for the ride down the hill. Where were these cyclists coming from? My cough was getting worse so I dozed off between coughing fits into a nice sleep. The power of the Maligne River in summer is undeniable with the rushing water crashing fall after fall. Maligne Canyon in the winter is an entirely different experience. Sections of the river solidify to create a navigable, tranquil slot canyon adorned with frozen waterfalls. We took a day trip to Jasper, Alberta to go on the Maligne Canyon Icewalk through Maligne Adventures. We booked our tour online a few days before. 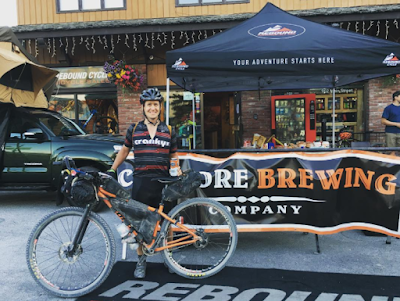 On the big day, we arrived at their office inside Pure Outdoors Outfitters where we signed waivers and they provided us with warm, waterproof boots and ice cleats. We hopped on the shuttle and met a friendly traveller named Camille from Montreal. On the shuttle drive to the canyon, there was no shortage of wildlife viewing. We drove past a pack of coyotes and saw a huge number of elk grazing outside the townsite entrance. 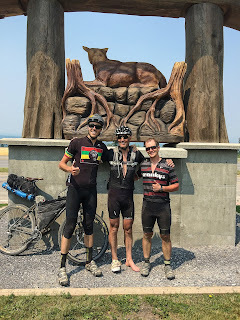 With the bears in hibernation, it was strange for me and Dean to turn off our bear awareness, which has been deeply ingrained from bikepacking and backpacking. We arrived at the 5th Bridge entrance, stepped off the bus and took in the lack of view. The mountains were hidden behind clouds and snow. We put our ice cleats on and entered the canyon. It was -17°C (1.4°F) or -24°C (-11.2°F) with the windchill but inside the canyon we were sheltered from the wind. We hiked Maligne Canyon with our kids in August so it was bizarre to be hiking on the exposed rocks that were submerged in the river just a few months before. The island I could only view from a distance in the summer was no longer an island but blended seamlessly into the riverbank. Our tour guide, Brody, informed us that the water maintained a temperature of about 5°C (41°F) where the river flowed out of the ground. We reconnected with the marked trails, soon to approach a section where the river disappeared under the rocks. Where the waterfall was once noisy, it merely hissed beneath an intriguing shell of ice and then disappeared beneath the rocky riverbed. Framed by the pristine snow and the icy shell beginning to form around the edges, the silly string waterfall seemed more beautiful in the winter. The less it looked like a spider web, the better, I think. The chain-link had been rolled down on a section of the safety rail. It was our entry point into the main event. We stepped off the riverbank onto the frozen river. Even with the ice cleats on, it was very slippery. Note to self: Next time, bring hiking poles! Brody advised us to walk on the wet ice when possible because it was grippier. I never thought I would be eager to walk on wet ice in my life. We were on a gradual incline. It would be seconds of fun sliding down sections on the way back. Before crossing a narrow, slippery bridge made of skinny logs, we stepped in about 4 inches of water. The warm rubber boots worked great. The chill of the water didn’t infiltrate at all. The canyon began to narrow as we approached the 4th bridge. I couldn’t believe we were standing where it would have been impossible last August. We arrived at the first of the towering falls, in awe of its span and the beautiful blues. Something about the mountains brings out the Gollum in Dean. We got to explore behind another waterfall. I noticed similarities to Upper Antelope Canyon [located in Page, Arizona, 2352 km (1463 miles) away]. 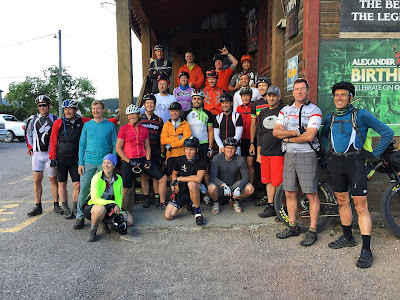 We toured it on the way home from the Tour Divide in July. I was fascinated with how similar forms could be found in such different places. One was carved out by the Maligne River in the Alberta Rockies and the other by flash floods in the Arizona desert. We stood on a layer of ice and snow at one and sand in the other. A chockstone was wedged between the canyon walls at Maligne and a log swept away by floods lodged in the other. The technology faced some challenges with the freezing temperatures. Dean stopped to change the batteries when his camera died but the batteries were fine. Water dripped onto the lens and froze in the camera. He switched to his phone camera and was able to take one picture before the cold took it down too. My phone later tapped out at Athabasca Falls even though the battery life was at 60%. We made sure to store them in inside pockets to warm them up. We had reached as far as we could go. I took so many pictures of the last frozen waterfall with this nagging feeling that I might miss something. Even as the tour group started to walk away, I was hesitant to leave until I got the picture just right. It wasn’t until Dean stepped into the frame that I had found the shot I was looking for. It encapsulated everything I was hoping for on this adventure: exploring with my other half and discovering new, beautiful places outside.